Irupu Falls or Iruppu Falls are located in the Brahmagiri Range in the Kodagu district of Karnataka, bordering the Wayanad district of Kerala. 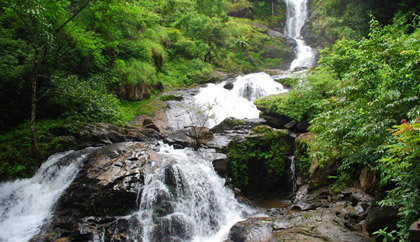 It is a fresh water cascade and is situated at a distance of 48 km from Virajpet on the highway to Nagarhole. The Falls are also known as the Lakshmana Tirtha Falls, derived from the name of the tributary of Cauvery which starts from these falls, the Lakshmana Tirtha River. A forest trail leads from these falls to the Brahmagiri Peak in Southern Kodagu. Irupu falls is a major tourist attraction as well as a pilgrimage spot. A famous Siva temple, the Rameshwara Temple is situated on the banks of the Lakshmana Tirtha River, en route to the Falls. This temple attracts a large number of pilgrims during the festival of Shivaratri. According to popular legend, Rama and Lakshmana, passed along the Bhramagiri range whilst searching for Rama's beloved, Sita. When Rama asked Lakshmana to fetch him drinking water, Lakshmana shot an arrow into the Brahmagiri hills and brought into being the river Lakshmana Tirtha. Due to this legend, the Falls is believed to possess the power to cleanse sins and is visited by thousands of devotees on Shivaratri day. The Rameshwara Temple located nearby the Iruppu water falls attracts a huge number of pilgrims during the festival of Shivaratri. It is believed that Iruppu waterfall possesses magical powers and they remove one's sins. On the day of Shivaratri, devotees take bath in Iruppu falls to get rid of their sins. The Temple has circular garbagriha and a low shikhara built in Kerala style. There are also shrines of Gandharva, Bhairava, Mahadeva, Ganapati and Parvathi. There is a Ashoka tree in the front which recalls Sita's captivity. During Shivaratri huge number of people visit the temple. Temple gates are closed between 1pm and 6pm. Munikal (means Sage Rock in Kannada) the ancient caves of Munikal are so quite that it is sound proof meaning no sound can enter or leave the cave. In ancient times sages use to meditate here. The deep valley is an excellent birdwatching site, but requires special permits. Munikal is 12 Kms from Irpu. Permad is 8 Kms from Irpu. There is a Hanuman's Shiva Temple here the story goes like this Lord Rama to please Hanuman shot an arrow from Irpu it landed at Permad and this was where a linga from Kashi was established. Lord Rama conceded that Hanuman's Shiva Temple at Permad would rank higher than the Ishwara Temple at Irpu. Even during Mahashivaratri, before the ceremony can commence at Irpu a puja is performed at Permad. The best time to visit the Falls is during the monsoons, when the Falls is at full capacity and is a breathtaking sight. Irupu is situated at 48km from Virajpet, 260km from Bangalore and 120km from Mysore. The Falls can be visited by the highway from Gonikopal to Nagerhole National Park off the Kutta Road after Srimangala. Bangalore is the nearest airport. Mangalore airport may also be used to reach the Falls.